Holt and the Teddy Bear is the tale of President Theodore Roosevelt's 1902 Mississippi bear hunter that resulted in the naming of the world's favorite toy, the Teddy Bear. the hero of this true story, Holt Collier, was born a slave in 1846 on a Jefferson County, Mississippi, plantation. Holt Collier led a life of adventure that included a stint as a Confederate cavalry scout, wild west-style gunfights, and hunting trips to Mexico and Alaska. Collier also worked for a while on the Texas ranch of Civil War general and Texas governor Sullivan Ross. A story from that period of Holt's life is related in McCafferty's children's book, Holt and the Cowboys. He was best known in his day, though, for being one of the greatest of American bear hunters. The night before their hunt, Roosevelt and Collier sat around the fire telling stories with the other hunters. Among that group were such turn-of-the-century notables as Illinois Central Railroad president Stuyvesant Fish; Tobasco Sauce heir John McIlhenny; soon-to-be Louisiana Governor John M. Parker, Huger Foote, grandfather of the late Civil War authority Shelby Foote; and LeRoy Percy, who later became a U. S. Senator and was the great uncle of the late novelist Walker Percy. Before retiring for the night, Collier jokingly promised the president a bear "if I have to tie one up and bring it to you." The next day Holt's dogs backed an old bruin into the waters of a sluggish bayou. Unfortunately, President Roosevelt was nowhere to be found. Before Holt could summon T. R., the bear grabbed Holt's favorite dog, a little yellow mongrel called Jocko. Holt couldn't shoot without risking Jocko's life. Gripping his rifle like a club, he leaped from the saddle and slammed the stock of the gun down on the beast's head. The bear Holt had promised the President fell semi-conscious in the bayou's muddied waters. Determined to do his best to salvage the situation, Holt threw a rope over the near comatose animal, dragged it out of the water, and tied it to a tree. Holt's joking vow to lasso a bear for the president had proved all too prophetic. Holt sounded three blasts on his hunting horn to call in the President and the rest of the party. Expecting an heroic scene of fang and claw, Teddy could scarcely conceal his disappointment when he saw the adled bear at Holt's feet. The crowd of hunters that quickly gathered only made things worse. "Shoot the bear! Shoot it, Mr. President!" members of the party shouted. Reporters from three major wire services were in camp, however, and Roosevelt, already frequently criticized for his hunting, was unwilling to risk a publicity disaster, Consequently, Teddy politely declined to shoot. Instead of disaster, the result was a public relations bonanza for T.R. Political cartoonist Clifford Berryman popularized the event with a caricature he called "Drawing the Line in Mississippi," a reference to Roosevelt's rigid opposition to Southern positions on the racial questions of that day. Soon everyone in America was talking about Teddy and the bear. Enterprising toy maker Morris Michtom, of Brooklyn, New York, in one of the shrewdest marketing ploys of all time, named his line of stuffed toys "Teddy Bears." They sold so well that Michtom expanded his business, forming the Ideal Toy Company the next year. Holt and the Teddy Bear is written for children in the lower elmentary grades. Both Holt and the Teddy Bear and Holt and the Cowboys are recipients of the National Christian Schools Association [NCSA] Children's Crown Collection designation, an annual listing of twenty children's book titles recommended by the NCSA "because they are well-written, they promote strong values, and they contain positive and uplifting themes," according to librarian Sandra Morrow, who established the Children's Crown Collection program in 1992. Follow this link for ordering information: Buy Holt and the Teddy Bear. 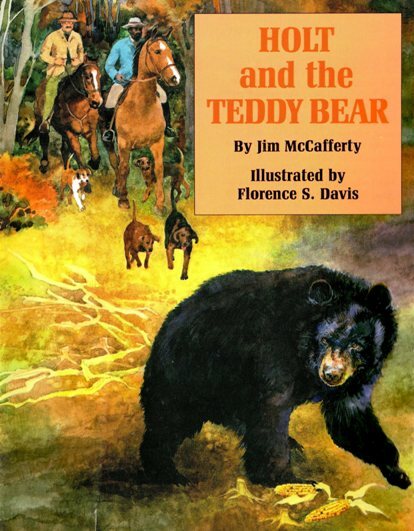 Besides Holt and the Teddy Bear, Jim McCafferty is the author of The Bear Hunter: The Life and Times of Robert Eager Bobo in the Canebrakes of the Old South and the children's book, Holt and the Cowboys. The Kindle version of The Bear Hunter can be previewed and purchased here. Follow this link for ordering information on all three books: Buy the Books.